Robin Wall Kimmerer (also credited as Robin W. Kimmerer) (born 1953) is Professor of Environmental and Forest Biology at the State University of New York College of Environmental Science and Forestry (SUNY-ESF). She is the author of numerous scientific articles, and the books Gathering Moss: A Natural and Cultural History of Mosses (2003), and Braiding Sweetgrass: Indigenous Wisdom, Scientific Knowledge and the Teachings of Plants (2013). She is an enrolled member of the Citizen Potawatomi Nation, and combines her heritage with her scientific and environmental passions. Robin Wall Kimmerer was born in 1953 in the open country of upstate New York to Robert and Patricia Wall. She grew up playing in the surrounding countryside. This time outdoors, playing, living, and observing nature rooted a deep appreciation for the natural environment in Kimmerer. Her enthusiasm for the environment was encouraged by her parents and Kimmerer began envisioning a life studying botany. Kimmerer remained near home for college, attending SUNY-ESF and receiving a bachelor's degree in botany in 1975. She got a job working for Bausch & Lomb as a microbiologist. Two years working in a corporate lab convinced Kimmerer to explore other options and she returned to school. She moved to Wisconsin to attend the University of Wisconsin, Madison. She earned her master's degree in botany there in 1979, followed by her PhD in plant ecology in 1983. From Wisconsin, Kimmerer moved to Kentucky, where she found a teaching position at Transylvania University in Lexington. She and her young family moved shortly thereafter to Danville, Kentucky when she took a position teaching biology, botany, and ecology at Centre College. Kimmerer received tenure at Centre College. In 1993, Kimmerer returned home to upstate New York and her alma mater SUNY-ESF where she currently teaches. Kimmerer teaches in the Environmental and Forest Biology Department at SUNY-ESF. She teaches courses on Land and Culture, Traditional Ecological Knowledge, Ethnobotany, Ecology of Mosses, Disturbance Ecology, and General Botany. Director of the newly established Center for Native Peoples and the Environment  at SUNY-ESF, which is part of her work to provide greater access for Native peoples to study environmental science, and science to benefit from a broader empirical perspective. Kimmerer is a proponent of the Traditional Ecological Knowledge (TEK) approach, which Kimmerer describes as a "way of knowing." TEK is a deeply empirical scientific approach and is based on long-term observation. However, it also involves cultural and spiritual considerations, which have often been marginalized by the greater scientific community. Wider use of TEK by scholars has begun to lend credence to it. Her current work spans traditional ecological knowledge, moss ecology, outreach to tribal communities and creative writing. Kimmerer has helped sponsor the Undergraduate Mentoring in Environmental Biology (UMEB) project, which pairs students of color with faculty members in the enviro-bio sciences while they work together to research environmental biology. Kimmerer is also a part of the United States Department of Agriculture's Higher Education Multicultural Scholars Program. The program provides students with real-world experiences that involve complex problem-solving. Kimmerer is also involved in the American Indian Science and Engineering Society (AISES), and works with the Onondaga Nation's school doing community outreach. Kimmerer also uses traditional knowledge and science collectively for ecological restoration in research. She has served on the advisory board of the Strategies for Ecology Education, Development and Sustainability (SEEDS) program, a program to increase the number of minority ecologists. Kimmerer is also the former chair of the Ecological Society of America Traditional Ecological Knowledge Section. In April, 2015, Kimmerer was invited to participate as a panelist at a United Nations plenary meeting to discuss how harmony with nature can help to conserve and sustainably use natural resources, titled "Harmony with Nature: Towards achieving sustainable development goals including addressing climate change in the post-2015 Development Agenda." Kimmerer received the John Burroughs Medal Award for her book, Gathering Moss: A Natural and Cultural History of Mosses. Her first book, it incorporated her experience as a plant ecologist and her understanding of traditional knowledge about nature. Her second book, Braiding Sweetgrass: Indigenous Wisdom, Scientific Knowledge, and the Teachings of Plants, received the 2014 Sigurd F. Olson Nature Writing Award. Braiding Sweetgrass is about the interdependence of people and the natural world, primarily the plant world. She won a second Burroughs award for an essay, "Council of the Pecans," that appeared in Orion magazine in 2013. Gathering Moss: A Natural and Cultural History of Mosses (Oregon State University Press, 2003) ISBN 0-87071-499-6. Braiding Sweetgrass: Indigenous Wisdom, Scientific Knowledge, and the Teachings of Plants (Milkweed Editions, 2013) ISBN 9781571313355. ^ "Writers-in-Residence Program: Robin Kimmerer." Archived 2013-04-02 at the Wayback Machine HJ Andrews Experimental Forest. 2004. Retrieved 17 July 2012. ^ Link to faculty page for Kimmerer at SUNY-ESF. ^ See Center for Native Peoples and the Environment at SUNY-ESF. ^ See "American Indian Boarding Schools Haunt Many," NPR, Morning Edition, May 2012. ^ "Kimmerer to Speak at U.N.—Professor to join conversation on 'Harmony with Nature' via SUNY-ESF. ^ Video at  UN Video, Kimmerer's remarks begin at 57 min. ^ Hertzel, Laurie. "Braiding Sweetgrass" wins Sigurd Olson nature writing award, Star Tribune, May 7, 2014. Gadoua, Renée K. (19 October 2016). "Mother earthling: ESF educator Robin Kimmerer links an indigenous worldview to nature". Syracuse New Times. Pember, Mary Annette. (22 February 2007). "Another Frame of Mind". In Diverse: Issues in Higher Education. Tompkins, Joshua. (30 November 2004). 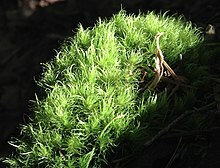 "Moss hunters roll away nature's carpet, and some ecologists worry," The New York Times.